Birnam steak grilled to your liking, topped with twister prawns and a creamy garlic sauce, served with beer battered fries and salad. For friendly service and casual dining in Canning Vale, dive into Nicholsons Bar & Grill on Birnam Road. Prepare for a feast inside this charming venue, seated by the log fire on cold days or take to an outdoor shaded courtyard to relax in balmy weather. 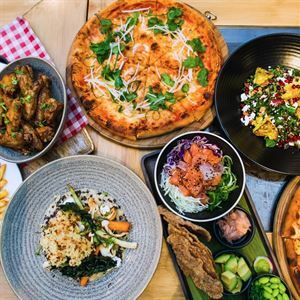 Specialising in fresh seafood, gourmet pizza, steak and pasta, Nicholsons' Mod Oz menu features a diverse selection of generous mains and Sunday buffet brunch, a great option for a family outing. Choose from dishes like the Summer mango spicy chorizo sausage pizza, perfect to accompany a roast pumpkin, feta and rocket salad, sprinkled with pine nuts. Bring your friends along and opt to share smaller plates like the flour dusted salt and pepper squid with beer battered fries and chilli mussels, or the pulled pork mini soft tacos. Established in 1984 as a function centre in 2000 it became the Nicholsons Bar and Grill that we know and love. Nicholsons caters to all group sizes from large functions to small intimate meals between a few people and also caters to takeaway meals and platters. I was part of the market day stalls today selling crafts and shared a wonderful Buffet High Tea with my friends.. What a great day of fun and shopping, we look forward to our next visit. Many thanks to Pia who worked tirelessly to make sure we all enjoyed the event. You will know who I am Pia when I ask after that Reindeer T,shirt. We have been here for christmas three years now with all the family about 16 of us and now complants from anyone.